Our house is set high on a hill side above the spectactular ancient city of Bodrum (Halicarnasis), today a white stone coastal resort of 25,000. Bodrum is Turkey's most attractive year-round leisure as well as yachting and archeological center, with an underwater archeological museum housed in the Crusader Castle of St. Peter, as well as excellent restaurants, bars and cafes in a magical, timeless setting. Excellent shopping both for household supplies and "exotica" of the region. The house is decorated in Mediterranean style with accents on white and blue, furnished with comfort as well as calm, aesthetic beauty in mind. 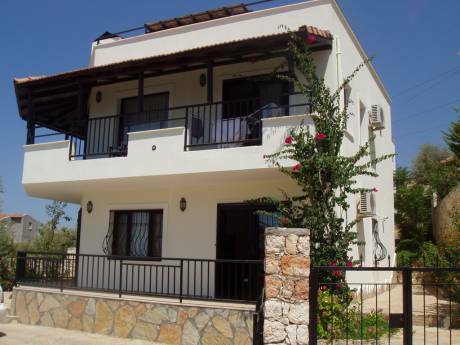 It is set in lovely gardens, shares a swimming pool with five other houses in a compound, has large terraces with spectacular views of the city,and castle, and the Greek island of Kos. It is our second home when we are not in Istanbul. Our house in Istanbul is also available for exchange. It is a large villa near the Black Sea coast set next to a national forest, with lovely gardens. It is 30-45 minutes from city center by car. We are a semi-retired mid 60's American (husband) Turkish (wife) couple, husband a hotelier, wife a psychologist, interior designer. Our houses reflect our attraction to the world of Islamic and Ottoman culture and design. We are serious independent global travelers, when not enjoying life in Turkey.